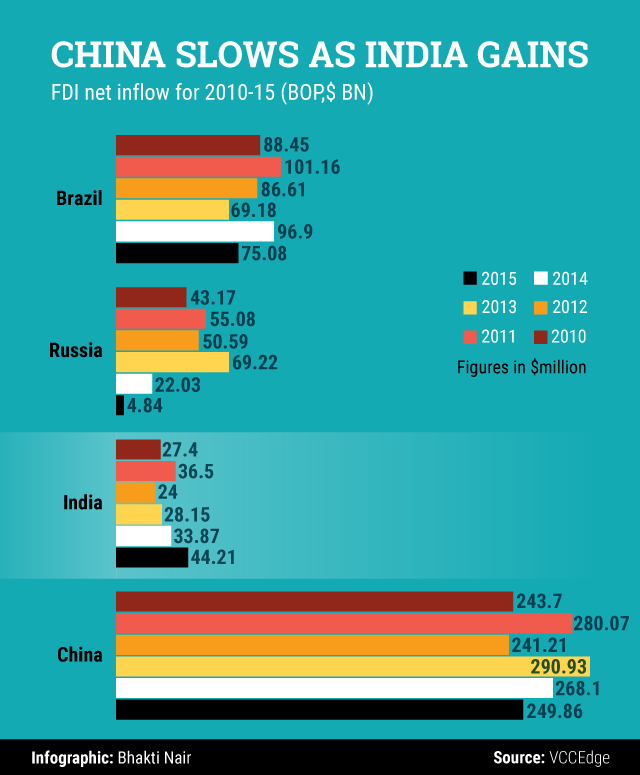 Even as China remains miles ahead of India in terms of absolute foreign direct investment (FDI) inflow (in 2015-16 its net FDI was nearly six times that of India), a closer inspection of the data shows that in the last three years, net FDI inflow into India has steadily risen while that into China has seen a secular decline. Data compiled by VCCEdge, the data analytics arm of News Corp VCCircle, show that from 2013-14 to 2015-16, net FDI inflow into India was up nearly 60% from $28.15 billion to $44.21 billion, registering a steady increase each year. During the same period, China's net FDI inflow saw a decline of more than 14%, from $290.93 billion to $249.86 billion. In 2015-16, India received a bulk of its FDI from three major sectors, the VCCEdge data reflect. While the services sector, which includes banking, finance, insurance and outsourcing among others, got a little over $6.8 billion, computer hardware and software and trading got $5.9 billion and $3.84 billion, respectively. Ever since the Narendra Modi-led National Democratic Alliance government took office in May 2014, it has been pushing aggressively to attract more foreign investment into the country. Last month, the government had announced the second round of FDI reforms, relaxing norms across most sectors. In fact, following the announcement, Modi had said that the latest set of reforms had made India the “most open economy in the world". Having said that, the Modi government’s efforts seem to have done little to attract foreign investments into the country’s manufacturing sector. The government’s flagship ‘Make in India’ initiative, for instance, had almost completely failed to usher in FDI, as reported by VCCircle in a June report. Absolute numbers, however, tell half the story. A further perusal of the FDI data shows that not only has India narrowed the gap in terms of absolute numbers, but also when net FDI inflow is considered as a percentage of the Gross Domestic Product (GDP). 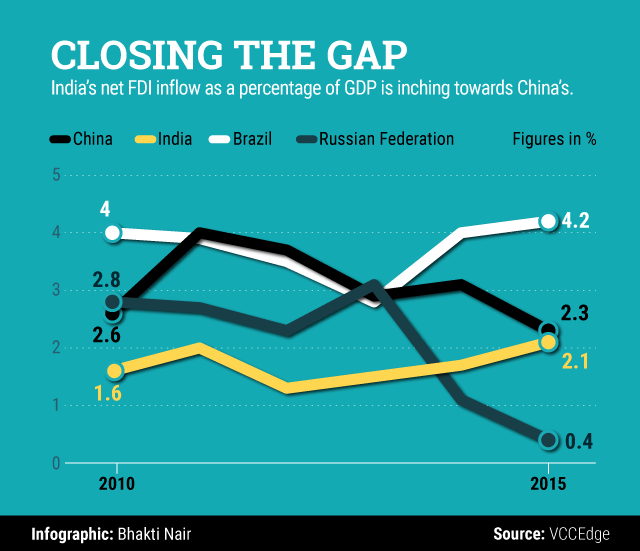 Data show that in 2013-14, China’s net FDI inflow was 2.8% of its GDP and, by 2015-16, it had slipped to 2.3%. During the same period, India managed to up its net FDI inflow from 1.5% to 2.1% of its GDP. This suggests that not only are foreign investors more wary of investing into China now than before, but also that Chinese investors themselves are increasingly finding newer investment avenues abroad. In fact, several news reports (here, here and here) in the last couple of years have indicated that the pace of growth in FDI inflow into China has slowed while outbound investments have surged. Reports also suggest that the Chinese manufacturing sector plagued by overcapacity, rising labor costs and law enforcement issues have worried investors.